Process adaption equipment ensures you are getting the best performance from your measurement sensors. From simple, flow-through housings to automated, retractable sensor housings we have the right solution for ensuring production safety/reliability and for meeting legislation requirements. 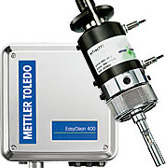 Mettler Toledo automated sensor cleaning and calibration systems further enhance process control and safety, and reduce the maintenance burden. Automatic or manually triggered sensor maintenance allows staff to work on more important tasks. In addition, regular sensor cleaning and calibration ensures sensors perform at their best and last longer.